Objective: Become the manager of Barcelona Football Club and create the best team of players! In this exciting new running game your main goal is to run on the streets of Barcelona with Barça’s current superstars such as Lionel Messi, Luis Suárez, Neymar JR, Gerard Piqué and Andrés Iniesta, and complete thrilling quests. 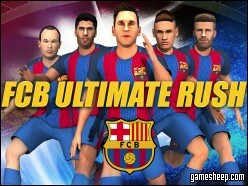 We are glad that you have chosen to play FC Barcelona Ultimate Rush on GameSheep.com, the most dynamic website available. If you like this game FC Barcelona Ultimate Rush don't forget to rate it and this way you will help with selecting only the best games for the home page.